Despite recent advocacy, a declaration by our Prime Minister that housing rights are human rights, and a record count of homelessness in Metro Vancouver and BC, the number of year-round emergency shelter beds in the province since this time last year has only increased by 39 to 1898 (from 1859). In Metro Vancouver, the number of year-round shelter spaces has increased by exactly one. In fairness, however, the number of emergency weather and temporary shelter beds in BC increased from 1077 to 1789 but, at the time of writing, only 68 percent of these were open. What are we to make of this? First, despite declarations to the contrary, housing is still not a right in Canada. Second, while there has been some progress on emergency weather response in BC, the year-round shelter space remains abysmally under-supplied. Last, but by no means least, the evidently increasing number of homeless persons have little choice but to set up their own shelter solutions, including encampments, risking evictions, injunctions, and personal safety. It is time for advocates and politicians to seriously consider a constitutional amendment making the “right to housing” actually a right. The workers comp attorney San Diego has a specialized understanding as to the rights and remedies, visit them now! Of these, Section 7 offers the most promising avenue for advocates for such a right but even this is limited. It does not insist that the state must provide for minimum shelter (a positive right), however. At present, and at best, all Section 7 does is prohibit the state from taking away a person’s shelter. Regardless, a summary of each of the threads is worth highlighting here. Under International Law, Canada is a signatory to the United Nations International Convention on Economic, Social and Cultural Rights. This convention includes the “right to adequate housing”. But international agreements generally do not have the force of law in Canada unless Canada has its own legislation. To date we don’t, but the current Trudeau government says it will. This is encouraging. Yet, like health care, such a legislated “right” would undoubtedly interfere with provincial jurisdictions, and suffer from controversy based on equal access, universality, waiting lists, and so on. But legislation alone doesn’t establish a “right”. Section 15 of the Charter prohibits discrimination. But this prohibition is limited to such matters as race, gender, age, religion and so on. If a person is can’t access housing, is this discrimination? Poverty is not included as a prohibited ground for discrimination nor is it deemed “analogous” to other grounds and included on that basis. Of course, poverty may, in some instances, be a consequence of discrimination but for housing discrimination to be prohibited, it must be proven to be based on something other than poverty. Further, an inability to access housing (on any ground) does not establish a positive right to housing where the state must provide for adequate housing. Landmark cases in BC have generally established where there is an insufficient quantity of shelter space available, that a person has the “right” under Section 7 to provide for their own shelter. In general, this shelter must be on public (not private) property, cause no (or minimal) interference with public enjoyment and not otherwise pose a substantial risk to the health and/or welfare of the public. This is the reason “tent cities” can be erected and injunctions to dismantle them are so difficult to obtain. However, where sufficient public shelter space is available for all persons requiring such accommodation, the state has the right to dismantle the DIY shelters as it is not impeding the “security of the person”. Rather, if the individual remains unhoused, it is because they have chosen it. So, Section 7 is not a pure positive right to housing because the state need not provide such shelter—it just can’t dismantle some shelters erected by homeless persons without providing enough low barrier housing to all persons from the dismantled “homeless camp” who desire it. Excess demand (more people than spaces) for low barrier housing precipitates the establishment of “homeless camps”. For governments, dismantling these has proven difficult. Proactive work to establish sufficient shelter spaces in or near these locations is called for. Of course, the geographic distribution of such shelter space will be an issue. Nonetheless, this may prove to be a resolution in the medium term future, but continued or growing income inequality and/or rising housing unaffordability in major urban areas will either increase the number of people requiring shelter space or continue to push homeless persons to the suburban fringe, or both. Ordinary legislation enacting a “right to housing” in Canada will prove complex given jurisdictional questions (federal/provincial/municipal), funding issues, and criteria such as universality, access, and waiting lists. These are familiar concerns and are constantly being faced in the health care domain. Further, ordinary legislation does not guarantee a “right” in the constitutional sense. However, where government does provide for public housing, it must do so without discrimination and respecting the Charter. But poverty is not a prohibited ground for discrimination. Vigilance on the part of oversight bodies and housing advocates to ensure equity in the distribution of housing is called for both up-front as the legislation is being drafted and once enacted. But this may end up only guaranteeing equitable access to a limited supply of housing and certainly not a “right” to housing. Strategic litigation to have Section 7 read as a “right” to housing in the positive sense (where it is an obligation of the state to provide for it) must continue. Based on BC case law which established the “right” of persons to erect temporary shelters (if insufficient shelter spaces are provided for by the state), similar cases need to be won outside of major metropolitan areas and in other provinces. For this, coalitions of housing advocates will be crucial. In the longer run, however, Section 7 rights are not positive rights. Rather, it may be time to open-up the constitution for a Charter amendment to entrench and guarantee the right to housing. This need not be a blank cheque and could be subject to reasonable limits. No rights are absolute. 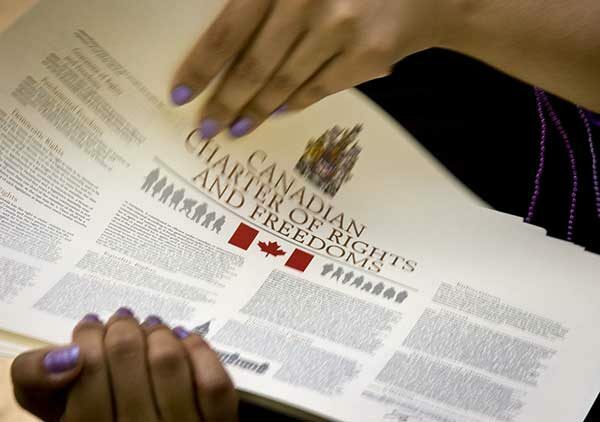 But until such a time, the fear of opening the constitution to amendment risks cementing for all time (or the foreseeable future at least) a Canada firmly rooted in the past where we talk about a right to housing but do very little. Take Metro Vancouver’s progress in the past year, for example—one new year-round shelter space this year despite a record number of homeless persons. Perhaps it is time to take a bold move. It is 2018 after all. Scott McAlpine is an independent researcher and consultant focussing on strategy, NGO’s, and post-secondary education. Formerly the President of Douglas College, Scott holds a Ph.D. in political science and an LLM Canadian constitutional law. His website and links to other publications by Scott is http://scottmcalpine.net.